Some of the most thrilling missions are when I have entrusted to lead the work on a digital product for several design and evalueringsfaser, and gradually make the product better. 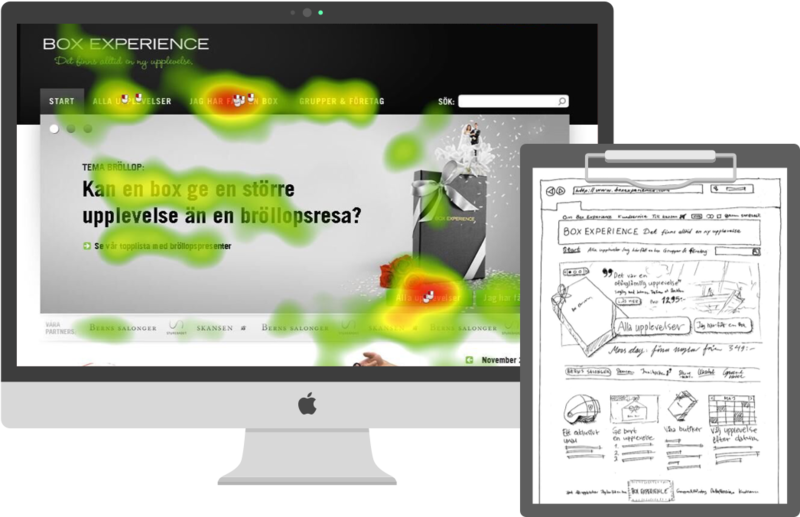 In this assignment for Box Experience could the eye‑tracking tests provide important clues on how the service should be developed and a new concept being developed. The results showed a significant improvement in the final product. Box Experience is a well known brand in the experiences and gifts online. They offer a wide range of experiences that can give away the physical or send over the network. The company had several problems with its interaction and needed to find a more optimized way for customers to order, reserve and plan their experiences on the page. One of the most pressing problems was that some gåvomottagare not understand how they could turn their experience presented and therefore, by mistake, bought experience again when they went in to the site. The receiver was then sitting with two giftboxes. The mission began as an evaluation mission was transferred to a design project and follow-up tests. The development led to a site in a far better way looked to the needs of users of a simplified ordering and exposed experiences in a much clearer way. How to one get customers to find the right way and assimilate the information they need to act? The challenge of the project was to develop a new version of the service, which sells better and that gives gift recipient a positive experience when they book and plan their experiences. The first step of the project was to set up a user study with eye tracking. When users exposed to the site of the test situation, it became clear that the design of the site prevented users from finding and selecting experiences. Users with an experience gift was also difficult to understand where on the site they would book and plan their experience. The results of the study contained several important insights that could lead the design team in a new direction. One example was to test the users noticed the banner with the text “I have a box,” and responded more positively to it than they did on the “Activate” button, to plan and book, which could be found in the existing solution. The next step was to create a new interaction. This gave the experience of the study a variety of insights on what a new design would have to deliver in order to function optimally. By analyzing the goals in more detail, we could get further direction in the design of the service. The content delivered in the most prioritized business objectives were at the center of the design on the top of each page, where they would get the most attention. In Box Experience event was the most important thing to convey the concept around a box. Therefore, we sketched out a box in the top picture in the menu along with examples of popular gifts. The secondary business objective was to communicate partner companies’ trademarks as well-known experiences feels great to both give and receive. Therefore it was placed a row of logos belonging Box Experiences main partners under the main picture.The third major objective was to explain the concept in a way that users understand. To succeed in this exciting images were placed exactly where the browser window breaks, so that users would be attracted to scroll down the page. Here followed an explanation in point form, something that users proved to appreciate in previous studies. Follow-up test produced the receipt: The new site makes it much easier to both give and receive experiences. When the new concept had visual design, and as soon as the design was complete, the concept was tested again with new users. We remained in the same format as in the first study. It was immediately clear that the new design made it much easier for users to start their browsing of experiences, and those who had received a box could be much easier to book and plan their experience. Anvädarnas eye movements showed even how they easily found and wanted to take part of the description of how the site works. Marten's eye tracking study gave us, in detail, the evidence we needed to move on in our design process. In fact, the report with suggestions and improvements Marten presented very educational and introduced step by step. A bit like a do-it-yourself guide for how we could improve our site!